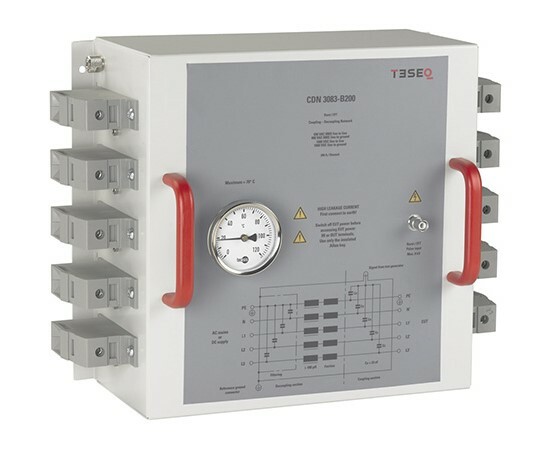 The CDN 3083-B100 is a manual 100 A three-phase EFT / burst coupling decoupling network (CDN). It is specially designed for testing Equipment Under Test (EUTs) up to 690 VAC (L-L or L-PE) and up to 1000 VDC (L-L or L-PE), and used for coupling fast transients (burst pulses) up to 8.8 kV (5 / 50 ns – 50 Ω) into the supply lines of the EUT. The CDN 3083-B100 is a high quality and affordable solution. It is ideal for industries and applications that require higher AC and DC voltages and currents, including power & telecom industry, renewable energy applications, electric vehicle and charging stations. There is a built-in thermometer provided which enables the heating effect to be monitored. The high quality components used in the design of the CDN enable users to even test for short durations at much higher currents than specified. The current limitation is largely a matter of thermal loading and ambient temperature. The CDN 3083-B200 serves to inject fast transients (burst pulses) up to 8 kV (5/50 ns – 50 Ω) into the supply lines of the Equipment Under Test. The CDN 3083-B200 is designed to be used with an EUT supply in AC mode up to 690 V in line to line or line to ground. DC voltage can be taken up to 1000 V line to line or line to ground. Although they are designed for 200 Amps, it can be used for higher current for shorter durations.